Carola Lodge i Huacachina, Peru: Reservér nu! 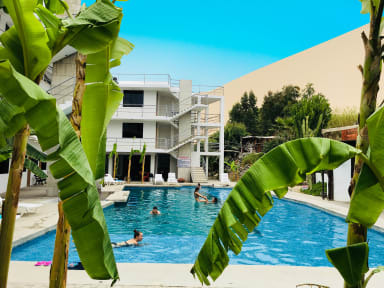 Carola Lodge is a renovated hotel is surrounded by a huge sand dune which you can climb without any problem, we are just a few steps from the Huacachina Lagoon. We have a vast experience in the hospitality sector, element that we do capitalize to bring the very best service and experience to our guests and travellers. We organize BBQ dinners and on weekends our disco has the best music and the best atmosphere of all Huacachina. We are located in Huacachina, one of of the most beautiful places of Peru. Near to our facilities you can fins some of the finest landmarks and attractions off our area such as Huacachina Lagoon, Malecón De La Huacachina and other relevant places in our area. In addition, the city of Ica is just some kilometers away, so it is quite easily to reach this city from our facilities. We have several types of accommodation options, all of them private. All the rooms are fully equipped with all the necessary services and amenities to ensure a great stay to our guests and travellers. In addition, we have several common areas where the guests and travellers can get together and exchange past experiences and future plans.